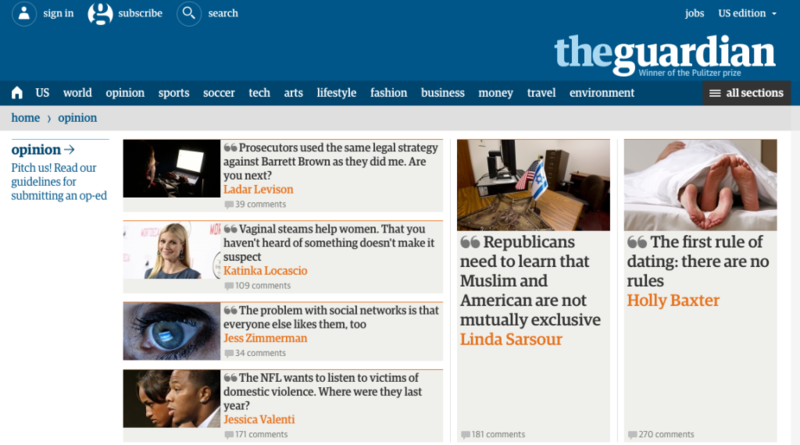 The Guardian just performed a major redesign based on new data from their home-grown analytics program. Abigail Edge (great name) from Journalism.co.uk interviewed Wolfgang Blau (great name too), director of digital strategy for the Guardian. You hear this a lot, because virtually all traffic comes in through a site’s side doors. From the relatively vague description, at the Guardian it means that you can assign widgets to individual pages and change layouts to articles in bulk based on their tags. It sounds like this means you can move a story up on the homepage or category page and enlarge the font or image. This means writers can hide rarely used input fields, choose from more default image sizes, switch to an uncluttered full-screen writing mode, drop in links to pull tweets, YouTube video or images, and preview stories in mobile views. Possibly more space for comments, the ability to share parts of a page, and editors can now move the best comments to the top.